This photograph of Reed Tooby and his children was taken in the early 1890s. The parents, seated, are Edward Reginald Reed Tooby, born 1857, died 1921 and his wife Emma, born 1858, died 1937. 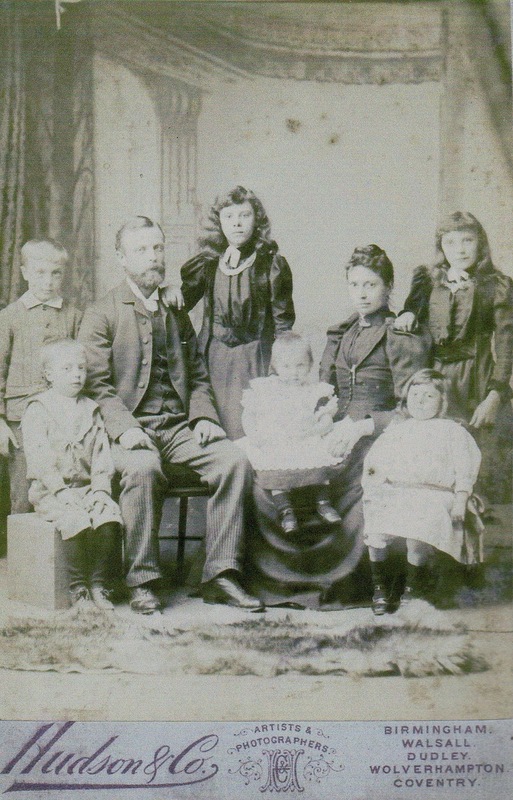 Their children are, standing from left to right:- Edward Reginald Reed, 1883 to 1973, Winifred Emma, born 1880 and Ethel Annie, born 1881; seated Charles Frederick, born 1886, baby Mabel Jane, born 1891 and Rachel Irene, born 1888. A third son, Norman George was born in 1894. Reed, the elder was a pupil at Wollaston Schools and all his children also attended the schools. Mabel was a pupil teacher in the Girls’ School between 1907 and 1909. Reed Tooby and his son, also known as Reed, were both in the building trade. The younger Reed served in the Great War and on his return bought most of Eggington Farm which over many years he developed for housing. He served as a Stourbridge Councillor and was Mayor of Stourbridge in 1952. The family lived in Enville Street and later Cathcart Road.